What makes a Good Project Plan? It isn’t fancy software and it’s not colourful wall charts, it’s the knowledge that the plan is based on accurate and complete information. Sounds easy? It can be easy to create a project plan; the difficult part is keeping the plan accurate and complete! From one day to the next you can find your Project Plan, which you were immensely proud to complete, is now out-of-date and way out of schedule! So what are some basics of Good Project Planning? 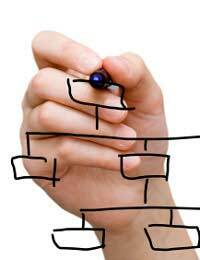 The Project Plan needs to adapt to the project world that it encompasses. This doesn’t mean that we have an ever-moving target, however it does mean that we must ensure the Project Plan reflects the truth. If the end date is no longer achievable then action needs to be taken – to either move the end date, or alter the tasks leading to the end date so that it does come within schedule. It’s very important that a Baseline (official copy) is taken once a Project Plan has been agreed. Expectations will be based on this version of the Project Plan, particularly with sponsors and stakeholders, and any changes, outside accepted boundaries, need to be approved. If you don’t take a Baseline and then alter your Project Plan, you won’t know if you on target or not! It’s very likely that a Project with have a number of Baseline plans throughout its life, reflecting the stages where major changes were approved. As a Project Manager you don’t necessarily know exactly how long tasks might take. You may, from experience, have a good idea, but it’s always best to involve the people who will be doing the work. Not only will they feel confident that the estimate is realistic but it will build their commitment to the project. An enforced estimate is likely to be seen as unachievable from the start, but they may not tell you so! Get the people who are doing the tasks to own the tasks! And this means informing the project if delays are likely. Although delays are dreaded on a Project, it is better to know and prepare than to get hit with a surprise that you are then forced to deal with. Remind the team that the Project Plan belongs to all of the team, and not just the Project Manager. People are often optimistic and want to please. Therefore you may want to allow some extra time on their estimates just in case! A Project Plan needs to go to varying levels of detail depending on the audience. Some staff will be able to complete activities with less detail than others; some inexperienced staff may need small duration tasks. The Project Sponsor and Stakeholders will not want to go down to low levels of details, and often they simply want to know where the issues and bottlenecks are on the plan. Staying on top of your Project Plan is ensuring that it is regularly updated. A good Project Manager is looking ahead and seeing any potential issues in the future. This way they can plan and make changes today, which will avoid or minimise difficulties later on. The art of Project Planning is not fire fighting one issue after another, it’s ensuring the Project Plan is up-to-date and has sufficient contingency to allow for planning for the future. Contingency is an allowance for things not going to plan – and these are typically the risks occurring that are in the Projects Risk Log. Contingency is not an allowance for poor estimating and if it is used for this, the Project Manager will quickly find there isn’t enough in the reserve to cover risks when they do happen, and they will! A good Project Plan provides an accurate reflection of the Project as it is today and as we can predict into the future. It acknowledges that there are unknowns and risks, and builds in appropriate contingency, while ensuring all estimates are realistic by involving the experts.